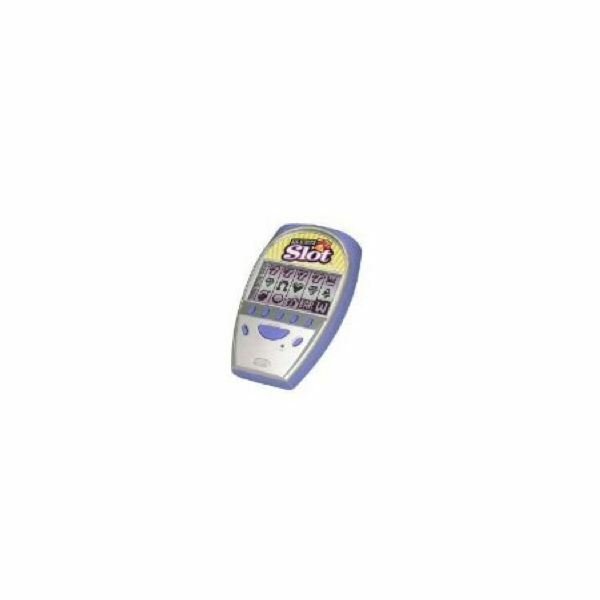 The Casino 5 Games Hand Held Electronic Game with FM Radio comes with five casino games. Listen to your favorite songs while you play draw poker, blackjack, baccarat, deuces or slots. You can adjust the volume or mute the sound if you would rather play the game quietly. The idle shutdown will preserve your winnings. However, turning the game off will clear all high scores. The price is around $11 at Amazon. Bee’s Illuminated 3-in-1 Casino will entertain you with poker, blackjack and slots. Each game is played on a big, illuminated screen with bold graphics. Two AA batteries are required. Pick one up at Amazon for around $20. 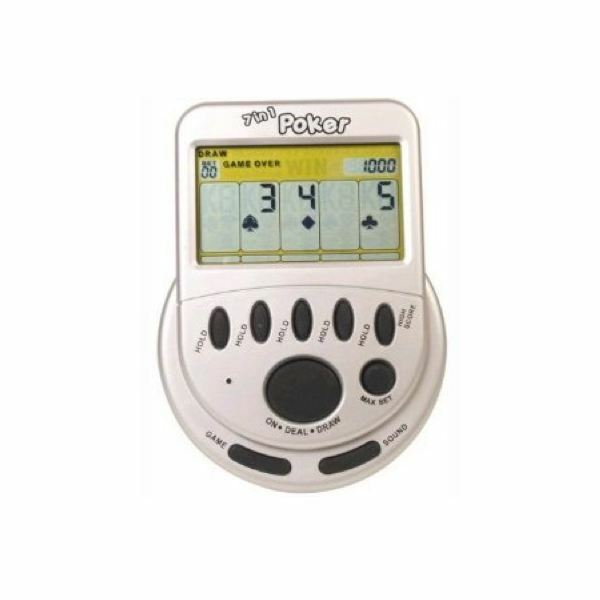 Executive Handheld Electronic Draw Poker will help you pass the time while waiting in airports or the doctor’s office. One improvement that this game could use is a backlight. The screen is too dark, which forces you to hold it in front of you in order to play the game. That said, it comes with a tutorial so that you can learn how to play draw poker if you have never played before. Find this game at Amazon for around $25. 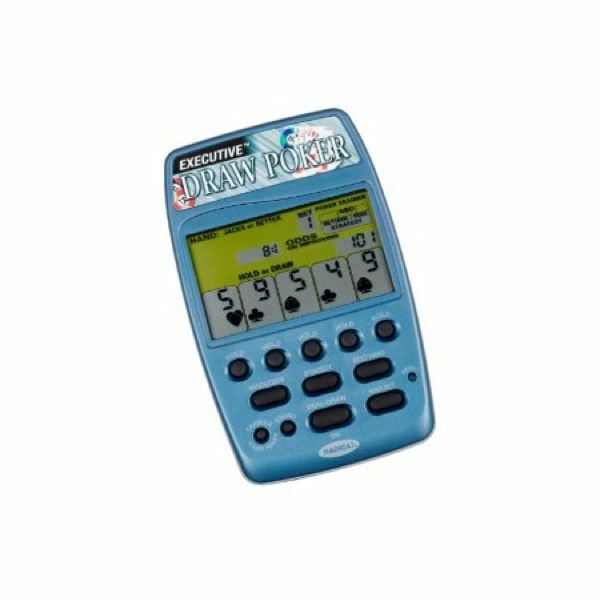 The Mega Screen 7 in 1 Poker handheld electronic casino game comes with a large screen for easy viewing. It includes Draw, 2’s Wild, Double Bonus Poker, Double Double Bonus Poker, Bonus Poker, Jokers Wild and Double Jokers Wild. 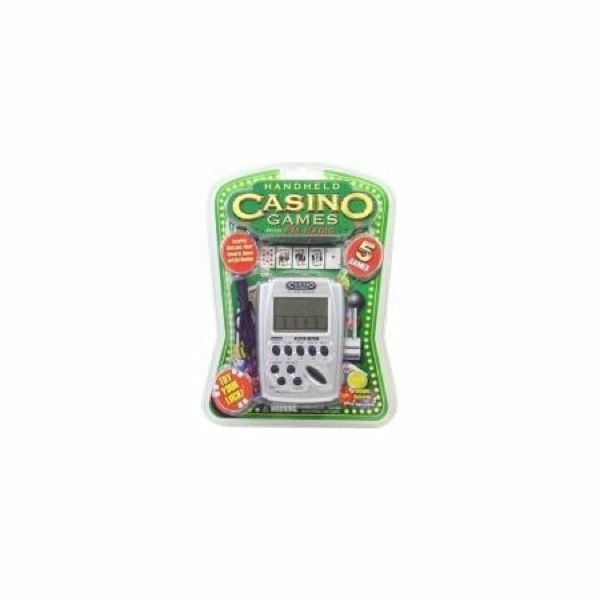 Two AAA batteries are included so that you can play this casino game right out of the package. 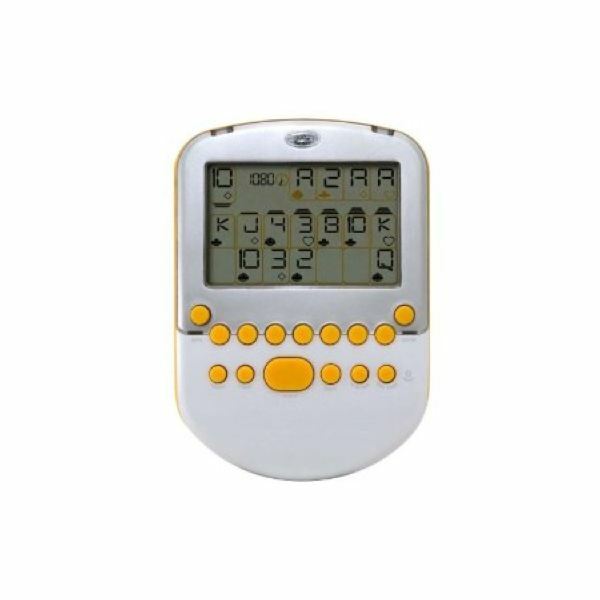 The energy saver will turn the game off after it sits for two minutes. The price at Amazon is around $19. Big Screen Slot is a 4 in one handheld electronic casino game. It has five spinning reels and a large animated screen. However, the screen needs a backlight for easier viewing. As it is, you may have to hold it under adequate lighting in order to see the screen. The games included are Slots, Double Spin, Change Up and Skill Stop. It is similar to the penny slot machines in Vegas that have those animated bonus rounds, if you hit the right combination. You also have nine-line betting and credit per line betting. The cost at Amazon is around $16. 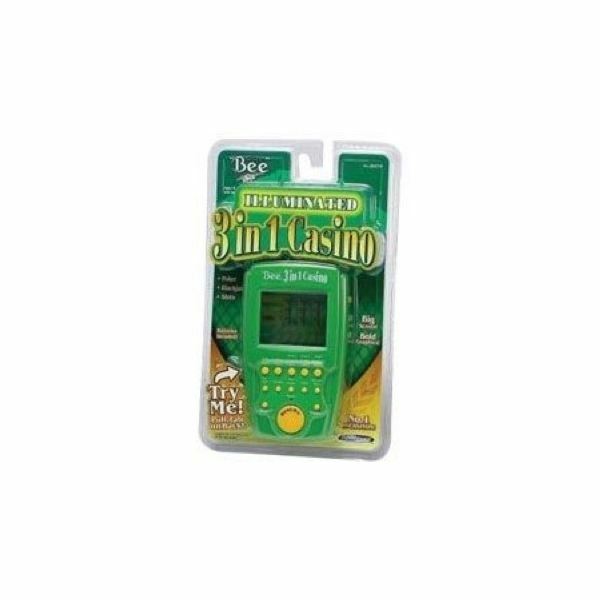 Big Screen Solitaire has a backlit screen and bigger cards that allow for easier viewing, especially indoors or at night. You can move the cards around easily and even undo moves with this game. Big Screen Solitaire comes with two games – Klondike and Vegas. If you are up to the challenge, turn on the electronic timer before you play. If not, then play at your own pace. Four AA batteries are included. Pick one up at Amazon for around $14. Radica Pocket Poker offers classic Vegas style Video Draw and Deuces Poker. 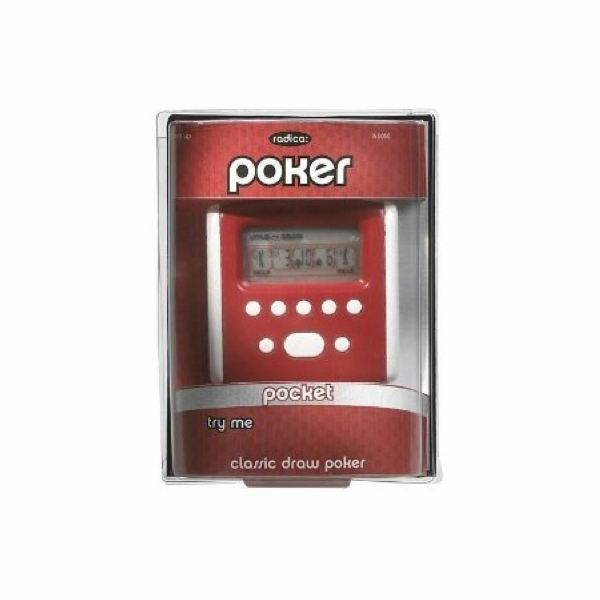 Pocket Poker will challenge your skills while providing you with hours of entertainment. One AA battery is included. Find this casino game at Amazon for around $11. All product information and screenshots courtesy of Amazon.